The United Nations agricultural agency created an online database that uses satellite data and Google Earth images to figure out how much water is being used to irrigate crops, focusing on parts of Africa and the Middle East that are facing water scarcity. “Water use continues to surge at the same time that climate change – with increasing droughts and extreme weather – is altering and reducing water availability for agriculture,” said Maria Helena Semedo, Deputy Director-General of the UN Food and Agricultural Organization (FAO) Climate Change and Natural Resources. Known as WaPOR, the open-access database measures evapotranspiration – how water evaporates and returns to the atmosphere, according to FAO. “Evapotranspiration thus provides a direct measure of the water consumed by a crop during a growing season and, when related to the biomass and harvestable crop yield, allows for calculating the crop water productivity,” the UN agency said presenting WaPOR at a high-level meeting in Rome on “ “Coping with water scarcity in agriculture: a global framework for action in a changing climate”. WaPOR sifts through data to produce maps that who much food is produced for every cubic meter of water consumed. FAO, with support from the Government of the Netherlands, is currently focusing on African and the Middle East, with detailed data expected in October for pilot areas in Ethiopia, Lebanon and Mali. 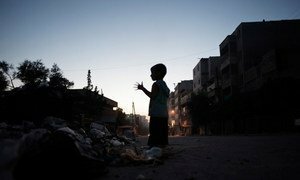 Senior United Nations officials, including the Organization's top humanitarian official as well as the head of the UN Children's Fund (UNICEF) have expressed “horror” at yesterday's attack on people evacuating from the besieged Syrian towns of Foah and Kefraya and underlined that civilians must be protected from any harm.